10th Annual Tables for Tots Charity Fundraiser - ID Studios, Inc.
ID Studios was proud to be part of the 10th annual Tables for Tots Charity Fundraiser, benefiting Ronald McDonald House Charities of San Diego. Each year, designers from across San Diego take a simple, wooden children’s table and chair set and design masterpieces that are then auctioned off to members the community where the proceeds are donated to the charity. G/M Business Interiors has organized the event since 2009 and raised almost $500,000 to date. This year was their most amount raised for any single year at over $81,000! This year’s theme was “Many Hearts Make a Home”. 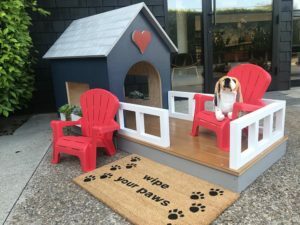 We know that dogs warm our hearts and are family members in many homes, so Jeni Champion and Mary Ford took the lead to design a house for our furry, canine family members. Spooners Woodworks did an excellent job at executing the design and Sherwin Williams provided the paint and painting supplies Dal-Tile and National Office Furniture sponsored other materials and accessories. We think everyone knocked it out of the park and we’d like to thank the entire team!